Orlando, Florida -- Dean Mead announced today that A. Felipe Guerrero has been elected to serve as the 2012 President of the Hispanic Bar Association of Central Florida (HBACF) Board of Directors. He was installed on January 21, 2012 at the organization’s 21st anniversary celebration dinner at The Contemporary in Walt Disney World Resort. 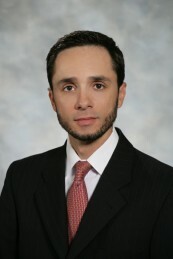 Guerrero is an Associate in the Orlando office of Dean Mead. His practice focuses on real property litigation, commercial litigation, creditors’ rights and landlord/tenant litigation. He graduated from the University of Florida Levin College of Law, with honors, in 2005. He received his undergraduate degree with honors in Political Science with a minor in Spanish from the University of Central Florida in 2001. Guerrero has been actively involved with the Hispanic Bar Association of Central Florida since 2007. He is also a member of the Orange County Bar Association, the University of Florida Law Alumni Council, the Florida Bar, and he’s a graduate of Leadership Orlando. “The HBACF is a budding rose that is ready to bloom”, said Guerrero. He added, “One of our main objectives is to significantly increase the size of our membership while adding value and purpose to it through the unique programs and initiatives that we have planned throughout the year”. The Hispanic Bar Association of Central Florida, Inc. (HBACF) is a non-profit organization that was incorporated on September 3, 1991. The role of the HBACF is to provide professional services to their local members who seek assistance on issues that affect the Hispanic Community. Ultimately, the Hispanic Bar Association of Central Florida works diligently to bring about a better understanding and confidence in their legal system for everyone.